Direct Response Copywriting: Is This Good Copywriting, Or Fluffywriting? Headline: "AT LAST . 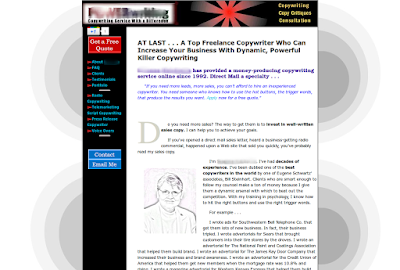 . . A Top Freelance Copywriter Who Can Increase Your Business With Dynamic, Powerful Killer Copywriting"
Sub: "...has provided a money-producing copywriting service online since 1992." Body: "I'm (copywriter name). I've had decades of experience. 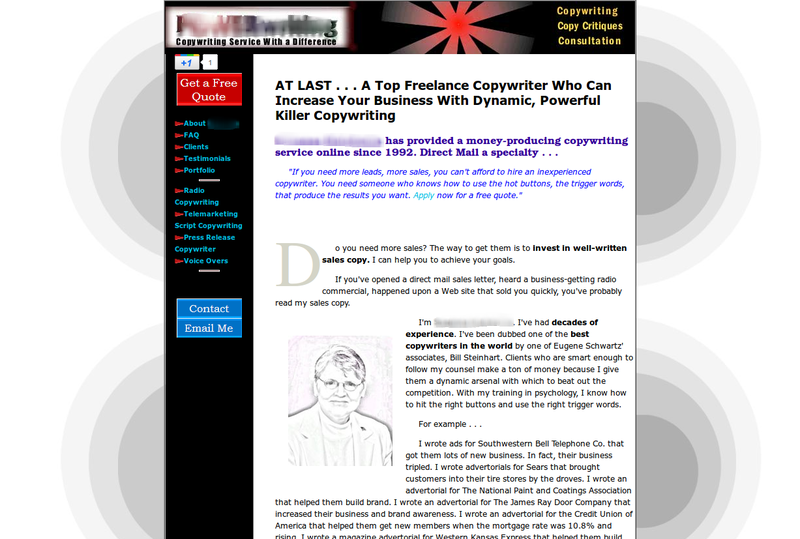 I've been dubbed one of the best copywriters in the world by one of Eugene Schwartz' associates, Bill Steinhart. Clients who are smart enough to follow my counsel make a ton of money because I give them a dynamic arsenal with which to beat out the competition. With my training in psychology, I know how to hit the right buttons and use the right trigger words." I can copy-paste all of the words in that landing page, but I am just going to waste my time and yours. Let's move on. OK. Now, how do we make this better? In the headline, instead of claiming that you can "...Increase Your Business...", specify, quantify. You are going to increase by how much? And in how many days... weeks... or even months? Anyone marketer out there can make that claim as well. How will you differentiate yourself from them and why should your audience choose your brand? Who in the world is Eugene Schwartz and Bill? Why should I (the prospective client) care? I don't care if your clients were smart enough to make money following your counsel. All I care about is how are you going to help me with my problem...? Where did you get your training in psychology and how will that help solve my problem? Are there buttons and triggers in my particular problem as well? I don't care about who you are, what you do and all your credentials. Talk to me about how much you know about my problem and how you are going to help me solve it. I am sure that if I were to spend an hour looking around her website, I'd find the proof that will support all of her claims. The thing is, my average attention span is the same as yours--4 seconds. My kids just got home from school... I have pending email to reply to... have to make dinner in a few minutes (what am I going to make for dinner). Just like you, I don't have the luxury to dig around her website. Alas--what does this tell you about this copywriter? Are you willing to spend money for her services, or would you rather shop around for someone who has answers to your problems?